How well do Darwinists do in debates with skeptics? UPDATE: Welcome Post-Darwinist readers! Thanks for the link Denyse! I thought that I would introduce a couple of my favorite critics of Darwinian fundamentalism, Stephen C. Meyer and Jonathan Wells. Here they are debating with Michael Shermer. I like Michael Shermer for two reasons – fiscal conservatism and engagement with his opponents. I’ve seen him MC sessions at Christian conferences. So let’s give him a chance to make his case. Dr. Michael Shermer is the Founding Publisher of Skeptic magazine (www.skeptic.com), the Executive Director of the Skeptics Society, a monthly columnist for Scientific American, the host of the Skeptics Distinguished Science Lecture Series at Caltech, and Adjunct Professor of Economics at Claremont Graduate University. Dr. Shermer received his B.A. in psychology from Pepperdine University, M.A. in experimental psychology from California State University, Fullerton, and his Ph.D. in the history of science from Claremont Graduate University (1991). Stephen C. Meyer is director and Senior Fellow of the Center for Science and Culture at the Discovery Institute, in Seattle. Meyer earned his Ph.D. in the History and Philosophy of Science from Cambridge University for a dissertation on the history of origin of life biology and the methodology of the historical sciences. Previously he worked as a geophysicist with the Atlantic Richfield Company after earning his undergraduate degrees in Physics and Geology. Jonathan Wells has received two Ph.D.s, one in Molecular and Cell Biology from the University of California at Berkeley, and one in Religious Studies from Yale University. He has worked as a postdoctoral research biologist at the University of California at Berkeley and the supervisor of a medical laboratory in Fairfield, California, and he has taught biology at California State University in Hayward. Massimo Pigliucci, Ph.D., is a professor in the Department of Ecology and Evolution at State University of New York at Stony Brook, where he conducts research on the ecology of plant populations and the evolution of adaptations…. He received his doctorate in genetics at the University of Ferrara in Italy, his Ph.D. in botany from the University of Connecticut, as well as a Ph.D. in philosophy of science at the University of Tennessee. Let’s start with a short 15-minute debate between Michael Shermer and Stephen Meyer, moderated by Lee Strobel. Shermer: Let me commit the ad hominem fallacy by attacking the motives of intelligent design proponents instead of dealing with their arguments and evidence. Meyer: Two can play at that game, since evolutionists are atheists and secular humanists. But who cares? let’s stick to the arguments and evidence, ok? Strobel: Meyer, are evolution and Christianity compatible? Meyer: No, because evolution requires that the natural processes that create the diversity of life be random and unpredictable. Shermer: Well, maybe the natural forces could be caused by the designer but in a totally undirected and undetectable way, so you Christians could have blind faith and we could run the public square. Meyer: But Darwinism says and that no design is detectable in those processes, so they processes cannot be actually directed on Darwinism. Shermer: But the designer could use natural selection and mutation. 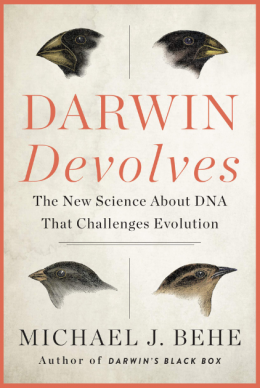 Meyer: If so, then why did Darwin explicitly reject God having a role in these processes? Shermer: I don’t believe in God because there isn’t enough evidence and it would require too many changes in my life. I like having autonomy from God and his moral demands. Also, we must always prefer material explanations, we can never infer that an intelligence played a role. I will only allow you to have two explanations of natural phenomena: 1) God didn’t do it, or 2) we don’t know. Meyer: I like that you allow “we don’t know” as an explanation if we don’t know, because that is a rejection of dogmatic explanations that don’t fit the available evidence. But the arguments for design are based on what we do know, not what we don’t know – science gave us these arguments – and the progress of science has only strengthened them. Well, I think it’s pretty clear who won, and who had the evidence! I like Michael Shermer, though, and I hope that he comes around to our point of view in time. At least he’s willing to debate, and he has a pretty moderate view compared to other Darwinian fundamentalists. Michael Shermer debates Jonathan Wells at the pro-Darwinism Cato Institute (in 7 parts), MP3 audio is here. Massimo Pigliucci debates Jonathan Wells for the pro-Darwinism PBS, downloadable video and audio. John Lennox debates against Michael Shermer about the existence of God. Here are posts on cosmological argument and the fine-tuning argument. I’ll respond to hopeful, but unwarranted, speculations about quantum mechanics and chaotic inflationary models, which I will be blogging about later. I’ll blog about molecular machines in a future post. An essay on the origin of biological information by Meyer is here and a debate between two software engineers on it is here. I’ll also mention Meyer’s forthcoming book Signature in the Cell. Don’t forget about the upcoming debate between William Lane Craig and Francisco Ayala! By the way, William Lane Craig has also debated Massimo Pigliucci on the topic “Does God Exist?”. UPDATE: Did you see my post on why Darwinists don’t allow debates like this to happen in school classrooms? AgainstAtheismAudioBiological InformationDarwinismDebateDebatesDialogDiscussionDNADogmaEvidenceEvolutionExchangeFossil RecordFossilsIntelligent DesignJonathan WellsLee StrobelMassimo PigliucciMaterialismMichael ShermerMolecular MachinesNaturalismPre-SuppositionProgress of SciencePublicSkepticSpeculationStephen C. MeyerStephen MeyerTranscriptVideoWho Designed the Designer?Who Made God? I thought that I would take a serious look at a couple of recent comments from the atheists who have been traipsing through looking for debate summaries. Normally I don’t allow these kinds of comments through to dirty up the blog, but these ones were clean. So, I thought I would post them for all to see how atheism compares to Christianity. First, let’s take a look at commenter Jason R.
First of all, commenter ECM, who is a deist, writes that the scientific arguments “make the painfully obvious case for deism”. As soon as that case exists then I’m sure Hitch will debate against it. So far the case doesn’t exist. Every argument for deism has been debunked, the supporters of which just need to perform a bit of due diligence and research it. Can you give a list of the arguments for a deistic God that have been debunked? Every single one that I am aware of. http://www.google.com is good starting point. It is a bad idea for atheists to insinuate that they have disproved the case for theism without citing logically valid arguments with premises that are supported by specific evidence. Because people like me are going to ask you: “what is your reason or evidence to support that assertion?” And you need to be ready to answer that before you make your assertions. If you cannot even list the arguments for theism, then you don’t know that they have been refuted. If your refutation of my scientific arguments is “Google it”, then maybe you should reconsider your assertions. You’re not helping your team when you cannot list arguments on the other side. Let me be clear: I can argue your case better than you can, and that should concern you. Traditionally, in a debate, one will attempt to at least refute the points laid out rather than falling back on “Google it” and then offering the standard boilerplate materialist reply that ‘it was all one big accident’ but not before, of course, taking a gratuitous whack at theists a la Hitchens. …Furthermore, if you do not wish to do so (and when your response is ‘Google it’ you clearly do not or cannot), then why waste everyone’s time with the same hollow argument that at least Wintery and I have heard a thousand times? Second, let’s take a look at commenter Arthur S.
Everyone of the scientific arguments from the Christian posts site (see list below) has been refuted time and time again as you well know (seek and ye shall find vs. ignorance is bliss) but christians persist in claiming them as being valid. The same is true of the philosophical arguments which are really more about word play than useful proofs of anything. Now ask yourself a question. What has he really said here? Well, nothing. He makes an assertion that my arguments have been refuted time and time again. What we have here is just an assertion without any evidence, followed by an insult, followed by an unabashed confession of ignorance regarding the construction of philosophical arguments. 2) Fine-tuning of physical constants and ratios to support the minimal requirements for life (see response to 4 below). 3) Origin of biological information in the simplest living organism (please read up on evolution before using this tired argument again). 4) Galactic, stellar and planetary fine-tuning to support the minimal requirements for life (Conditions for life exist throughout the universe. Christians fall into these kinds of traps all the time. Once contradictory evidence is demonstrated, they fight it for a few decades and then have to modify their belief system to accommodate the new findings. Kind of like how christians defended slavery in the U.S. in the 1900’s based on the bible until they developed some morals that were in opposition to the bible which contradicts the claim that our morals come from the bible). 5) Sudden origin of all animal phyla in the Cambrian explosion (”Sudden” if you consider 50 to 100 million years sudden and have an incredulous attitude). Let’s take a look at his replies point-by-point. No evidence is cited. There is a long-winded personal attack against Christians, which is irrelevant to the science. He says that evolution can explain the origin of the simplest living system. But evolution requires that replication already be in place, it cannot be used as an explanation of the first replicator. So citing evolution here is no defense to the explain the origin of the first replicating organism. No evidence is cited, but there is a long-winded insult. No source was provided for his “50-100 million years” number. The correct number according to the University of California at Berkeley is 5 million years. So that could just be an outright lie. And more insults, of course. No evidence is cited, but we do get yet another insult. So, there is popular atheism. No evidence, one probable lie, and tons of insults. I am not saying all atheists are like this, but many of them are like this. And I am talking about people with good degrees, good careers and good jobs. They really have never bothered to look into these issues. The creed of atheism is these ignorant, hateful diatribes. And that’s why they love people like Christopher Hitchens, and why many atheist web sites think he is a great debater. Because he is good at hating and insulting people he disagrees with. And that makes him the best atheist. On the other hand, Christians love people like William Lane Craig, because arguments, evidences and truth matter more to us. Our bestselling books are Lee Strobel books, in which scholars with one or more PhDs are interviewed about their academic research publications. Their bestseller is “God is not great”, in which an uneducated journalist goes on a hate-spree, without making a single formal argument against the existence of God. These are two different sets of values. And that is why when we have debates between William Lane Craig and Christopher Hitchens, all the militant atheists like Common Sense Atheism and Debunking Christianity have to award the victory to Craig. My recommendation is that you proof-read everything you write and remove all the personal attacks and insults. Then, for every assertion, you need to reference some data from a book published by an academic press, or a peer-reviewed research publication. That way, you will be able to sustain your arguments when you try to debate Christians. I know it feels good for you to hate and insult those with whom you disagree. And since morality and rationality unjustificable on atheism, since atheism cannot ground objective morality and free will, I am not surprised at your tone. But we were all created in God’s image. At least try to treat your neighbors with respect and tolerance. You can read see a list of arguments for and against Christianity in my post here.